Abstract: In order to probe into the reliability of the results of every other day running economy (RE) measure-ment, the author verified the results by using paired t-test, Pearson correlation coefficient, intra-class correlation co-efficient (ICC) and Bland-Altman method. 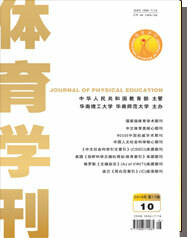 The author selected 12 student orienteers and middle and long distance runners as his research subjects, including 5 female students at an age of 20.501.00, with a height of 163.014.27cm and a weight of 52.963.28kg, 7 male students at an age of 20.250.71, with a height of 173.644.64cm and a weight of 66.574.60kg, measured RE at a room temperature of 20oC and a relative humidity of 45% and under the condition of consistent measurement time and order every other day, and revealed the follow-ing findings: the results of every other day RE measurement verified by using paired t-test had no significant differ-ence, showing a high correlation; the results verified by using ICC were relatively high, the distribution of the dif-ferences between the 2-time RE measurement results shown in the Bland-Altman diagram presented a normal dis-tribution, all the difference data were within the 95% consistency limit. The said findings indicate the followings: the reliability of every other day RE measurement is high; although it was found by the author that the reliability of every other day RE measurement is high, RE affecting factors are very complicated; during actual measurement, the researcher should always make sure that the testees are in a non fatigue condition physically during the two succes-sive times of measurement, let the testees have an over 30-minute treadmill familiarizing run two days before meas-urement, and keep the order and time of the two successive times of measurement as consistent as possible.